Politech creates digital products and delivers technology solutions that help political organizations, issue advocacy campaigns, and nonprofits thrive in a digitally driven world. We create websites, tools, and platforms custom fit to meet the needs of any sized program, campaign, or organization. 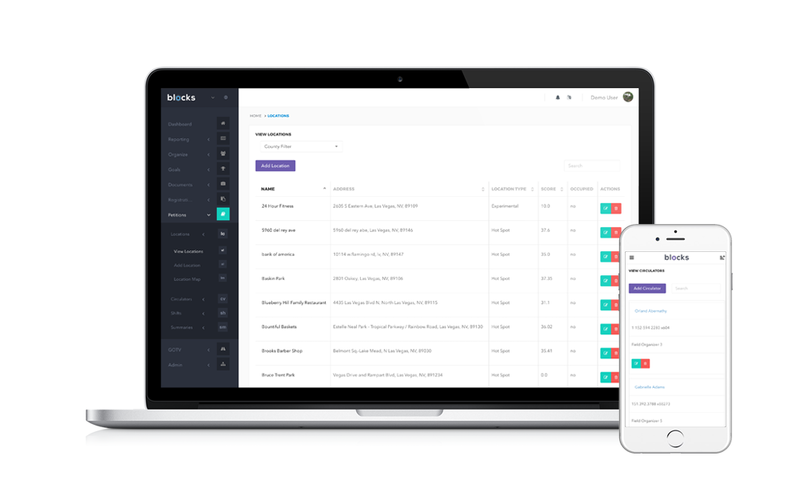 Blocks is Politech’s premier Software as a Service web application, which combines data entry, reporting, and program management tools into one platform. Politech specializes in building responsive web applications using the Ruby on Rails framework. We have built our clients customized web applications, integrated tech products with APIs, implemented data and targeting programs, executed experiments, and developed strategic marketing campaigns. In depth methodical evaluation of data sets, modeling, past and potential individual behavior, and election results provides sophisticated targeting for field, mail, fundraising, and digital campaigns. We delve into data sets and information to determine paths to victory. Our simple and intuitive reporting platform called Blocks centralizes your program’s data and visualizes it on interactive dashboards. 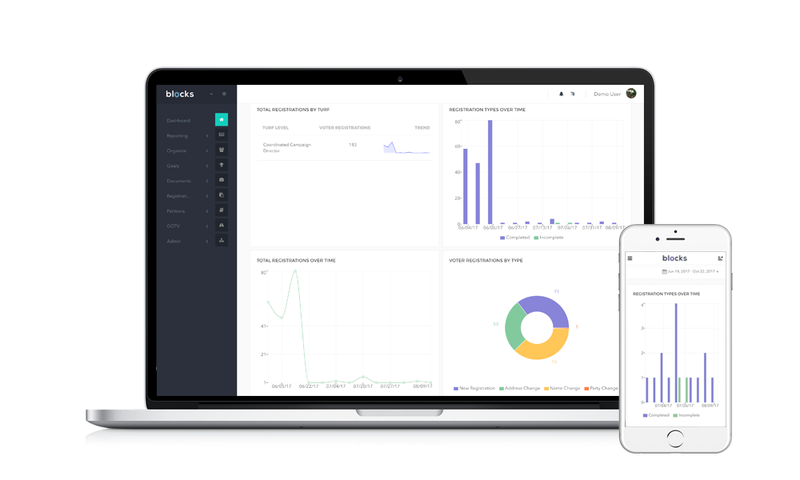 Blocks builds customized reports, records interactions with supporters, donors, and volunteers, and allows you to connect with your team. We build customized web apps that are designed to be fast, scalable, and durable. No challenge is too big, we innovate technology solutions that always deliver quick, accurate, and reliable results. We create custom, mobile-first web applications. Our modern designs are responsive and user friendly. Our sites are optimized to provide users with the best experience on any screen size and device. 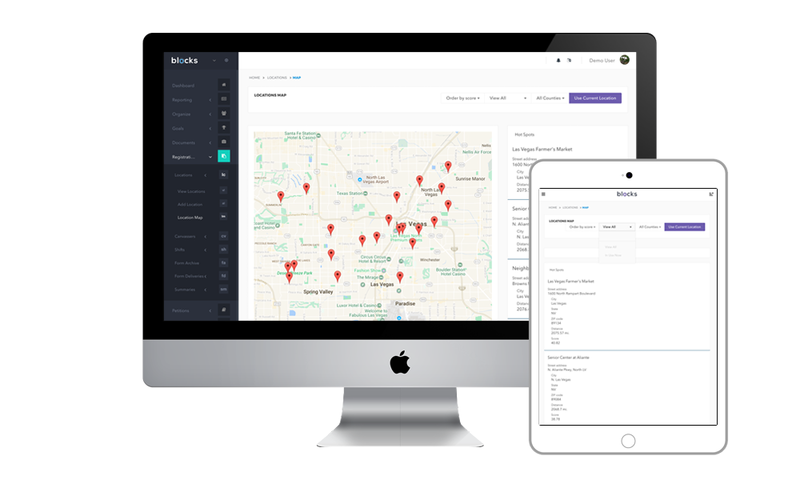 We integrate with APIs of existing web applications and platforms to connect all data in one central location. This process allows organizations to expand and enhance the overall performance of programs. Our team has extensive experience in development/design, data analytics, issue advocacy, and campaigns to provide programmatic support for organizations and political campaigns. We are deeply committed to public service and progressive social change. We are 100% minority owned and operated, inclusive of gender, ethnicity, and race. We work with our clients to craft technology products and plan programs that are comprehensively tested and continually optimized using real feedback and data.